A running discussion on the Cincinnati Reds and everything else in the baseball universe. On the eve of the Winter Meetings, it's clear that the Reds are about to blow up. Their phones, their 25-man roster, their future, it's all blowing up. There's going to be upheaval and things won't ever be the same. To say that the next few weeks are important is like saying Joey Votto's pants are just a bit snug. That is to say, understatement at its finest. How the Reds proceed over the next few days and weeks will determine their future. It'll determine how successful the rebuild is and how long it takes. Baseball operations are a decision-making business and some key decisions are on rolling in over the horizon. Given that the Reds are on the verge of overhauling their roster, it's important that they understand how their home ballpark impacts their players and overall performance. Way back when the BoSox won their first World Series in the Theo Era, the writers of Baseball Prospectus came out with a book about it called Mind Game. One of the early points they made about Theo's construction of the roster was that they first had to understand the park effects of Fenway. They argued that previous regimes failed to understand the park, as a result they were always overvaluing hitting and undervaluing their pitching. So, when they should have been bolstering their hitting, they were instead adding pitching. The front office's misunderstanding of the way the park played created flawed roster construction. The BoSox, before building the roster, had to understand the park and how it impacted production and performance level. If you don't understand how the park impacts performance, then you simply can't properly value your players. I feel like the Reds are now in the same situation. Before the Reds begin the rebuild, they need to understand what they have and what plays well in their home park. We all know that GABP is a hitter friendly park. In fact, everyone knows. All that said, I still don't think we *fully* appreciate what the park does to our hitters. Basically, it makes our mediocre hitters look good. Put another way, our good hitters aren't actually that good (well, except for one!). Just as a refresher, 100 is neutral. So, given that the index for Home Runs is 140, it is 40% easier to hit a home run in GABP than league average. Given an index of 94 for doubles, it's 6% harder to double in GABP than in the league average park. That's all well and good, but how does it impact our hitters? To me, it's fairly shocking how mediocre our hitters actually are. You usually don't see this type of extreme home/road split outside of the Rockies organization. However, the troubling part is that the Reds don't play in Coors Field. Coors is plagued by atmospheric issues, not ballpark dimension issues. They are constantly adjusting from sea-level spin rates and breaking pitches to high-altitude spin rates and breaking pitches and back again. As a result, the "true" performance level of the Rockies hitters falls somewhere between their home and road splits. The splits of the Reds, however, are driven by ballpark dimensions, rather than atmospheric issues. That's troubling because the true performance level of our hitters is the road split. If you want to know why I've always thought Todd Frazier should be dealt, you're looking at it. He's a GABP creation in the mold of Rich Aurilia and Joe Randa. He's too old, on the verge of getting expensive, and his production is massively inflated by Great American Ballpark. I really don't know what happened to Jay Bruce, but he desperately needs to be dealt. He needs a change of scenery and it's very difficult to look at his game and see any projection remaining. He seems very much what he is and it's not good enough for what we are or where we're going. It's probably too early to draw conclusions about Mesoraco or Hamilton, but there are some troubling signs about the former. All that said, seriously, how good is Joey Votto????? If I'm the Reds heading into the Winter Meetings, I'm focused on adding disciplined hitters. Not only is OBP one of the basic statistics most closely correlated to scoring runs, but it's undoubtedly one that plays about as well on the road as it does at home. It would make the offense more consistent and the Reds a tougher team to play on the road. I want players with plus-pitch recognition and something resembling plus-hit tools. I want hitters who fit the same offensive profile as Joey Votto and Jesse Winker. As I've written before, Max Kepler is at the top of my list. I'd build my offseason around his acquisition. If you add Kepler to Winker and Votto, then you have a potential core of incredibly disciplined hitters who control the strike zone, grind ABs, and avoid giving away ABs. That's what the team will need to compete with Cubs and Cards and Bucs in the future. 1. Max Kepler - I would center my rebuild around Max Kepler. Kepler, Winker, and Votto is one helluva core of professional hitters. With the announcement that Sano is joining Buxton in the outfield and the signing of the Korean DH, Kepler might be a surplus asset for the Twins. 2. Kevin Gausman - The Orioles are purportedly looking for a lefthanded hitting outfielder. I still think there is some type of deal that could be built around Jay Bruce here. 3. Mac Williamson - This is the outfielder the Reds should have acquired from the Giants in the Mike Leake deal. He's a right handed hitter with a strong walk rate and good athleticism. He could be an ideal fit in leftfield/rightfield for us. 4. Forrest Wall - Second baseman with a pure hit tool and good speed. 5. Brendon Sanger - A second tier prospect that piques my interest for his hit tool and plus pitch recognition, maybe we could get him and a touch more from the Angels for Brandon Phillips or something. Now that I've gotten my thoughts out, let's see what the Reds do. It seems like Aroldis Chapman to the Dodgers is on the verge of happening. The key to the Reds off-season is Max Kepler. Twins general manager Terry Ryan said Wednesday that the plan is for Miguel Sano to play right field in 2016. Just to recap, the Twins are planning on filling out two-thirds of their outfield with potential superstars in Byron Buxton and Miguel Sano. That doesn't leave much room for Max Kepler, especially since face of the franchise Joe Mauer is manning first base and new Korean acquisition Byung-ho Park holding down the DH spot. Add in the fact that the Twins have been impressed enough by Eddie Rosario to hand him the left field job and if you squint hard enough then Max Kepler starts to look like a surplus asset for the Twins. In short, it's starting to feel like the music has stopped and Kepler is still looking for a chair. Fortunately, the Reds have chairs for days and days. It feels like there might be a legitimate fit here. It doesn't hurt that the Twins and Reds are passing each other on the win-curve, moving in opposite directions. The Twins are ready to add pieces to put them over the top, while the Reds are hoping to slough off win-now pieces for future value. The Reds and Twins lineup nicely for a trade. I’ve seen Kepler in a few AFL games this year and came away really impressed with how calm he is at the plate. He seems very comfortable tracking pitches, to the point that it seems like he slows the game down a bit. I was surprised, because I was expecting him to be a bit more raw in his approach, as I would imagine a player born and raised in Germany would have seen far fewer total pitches in his amateur career than the comparable American born prospect. It remains to be seen whether he has the swing mechanics to develop into an impact hitter, but he seems like the type of hitter of who can recognize pitches, generate count-leverage, and be disciplined enough to draw a walk. Now, he just needs to learn how to drive the ball when he works the count in his favor. Maybe he never pans out, but he’s more interesting than I thought he’d be. Watching Kepler, his comfort level at the plate is astounding. He seems to identify and dismiss pitches faster than his contemporaries. Knowing in advance what the pitches are going to do gives him the appearance of owning the batter's box. Not only is his pitch recognition superb, but he uses it in conjunction with a very patient and disciplined approach. In his first 7 MLB plate appearances in 2015, Kepler saw a total of 37 pitches, good for a 5.3 pitches per PA. Obviously, that's an absurd degree of patience that will regress over more PAs, but that kind of patience in his first MLB stint is fairly remarkable. But, he's much more than just a patient approach. In 2015, interestingly enough, he learned how to drive the ball after working the count in his favor. In essence, his swing mechanics caught up to his plate approach, making him a complete and dangerous hitter. 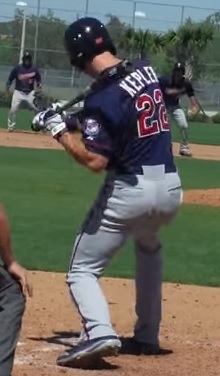 There is a tremendous amount to like about Kepler's swing mechanics. In these photos, you can see how he loads the back shoulder, creating real differential between the rotation of the hips and shoulders. 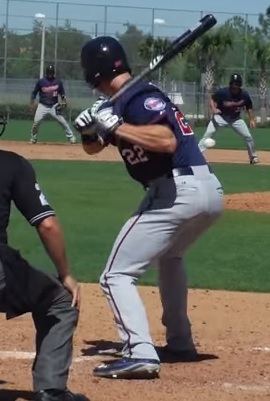 His hips fire first before the shoulders rotate open. He stays compact and upright to maximum the rotational force generated by his body. A key to high level hitting is generating maximum force and delivering it to the point of contact. Kepler's swing mechanics generate the force and his hand-eye coordination helps him deliver it to the point of contact. I already loved Kepler's pitch recognition and disciplined plate approach. Now, I'm a big fan of his swing mechanics, too. It's all coming together. For me, I'd do what it takes to land Max Kepler. If the Reds want to shallow out this down cycle, then adding Max Kepler would go a long ways towards accomplishing just that. If you add Max Kepler to Jesse Winker and Joey Votto, then fully 1/3 of your MLB lineup will be made up of hitters with plus-plus pitch recognition skill and very disciplined approaches. These are the types of hitters the Reds need. These are the offensive profiles that they should target. Over the next half-decade or more, the Reds will have to face a Cubs team featuring Anthony Rizzo, Kris Bryant, Kyle Schwarber, Addison Russell, and more. The Cards are never short on disciplined, professional hitters, in fact it's practically part of The Cardinal Way. It would serve the Reds well to build their own core of impact, disciplined hitters to keep pace. The Reds have a lot of talent (Aroldis, Frazier, Bruce, etc) to dangle in front of those teams looking to make a hot stove splash. If they play their cards right, then they could land the type of talent they need and ensure that the down cycle they are entering is as short as possible. Max Kepler is the key. The Reds recognized the inevitable. They simply couldn't afford Johnny Cueto. The best pitcher of modern vintage developed by the organization. One of the best international signings ever by the organization and, given his minimal signing bonus, one of its best values. Still, it was time to move on. The Reds traded him to the Royals in a deal that was a clear, clear win for the Reds (and one that worked out just fine for the Royals, too!). Personally, I don't understand why Reds fans aren't doing cartwheels in the streets over this deal. Instead, we get more hand-wringing over Walt's performance. For me, if this deal wasn't a home run, it was at least a stand-up triple. In order to evaluate the trade, you have to first identify what they gave up. Sure, fans have the emotional attachment to Cueto, but from a baseball operations perspective that's wholly irrelevant. What they gave up, from a baseball operations perspective, was 2+ months of on-field production and a compensatory draft pick when Johnny ultimately and inevitably departed after the season. To simplify it even further, they basically traded a compensatory pick, because the 2+ months of starts from Johnny Cueto had no value to the Reds. In fact, due to the combination of a collective bargaining agreement that actively incentivizes losing (higher draft picks, higher spending caps) and the organization's position on the win-curve (somewhere on the "noncompetitive" spectrum), you could easily argue that Cueto's remaining starts had negative value to the Reds. Simply put, Johnny increased the chances of winning the games he started and winning was no longer in the organization's best interests. For the Reds, the marginal value of each additional win was minimal to negative. So, all the Reds realistically had to do for a trade to make sense to generate more value than a compensatory draft pick. Instead of settling for a compensatory draft pick, the Reds cashed in Johnny Cueto in a big way. They traded half-a-season of service time of Johnny Cueto for potentially 18+ seasons of control over three southpaws: Brandon Finnegan, John Lamb, and Cody Reed. If we revisit the point about needing to sync-up the productive years of their assets, then this trade makes a great deal of sense under either a quick or total rebuild. If the Reds decided to keep Todd Frazier and Jay Bruce, then these guys should be productive soon enough. If they decide to move Frazier and Bruce, then these guys are young enough and controlled long enough to still be relevant to the rebuild. This deal works. John Lamb and Brandon Finnegan have already pitched in the majors. Cody Reed, who's pitching in double-A, isn't far away. These are pitchers who could/should arrive while Frazier/Bruce/Votto are still at the peaks of their careers. I have been familiar with John Lamb for quite some time, because he's been around for quite some time, but, in light of the ups and downs of his career, it had been a while since I had contemplated him. So, my first look at him after the trade was basically starting completely fresh. Interestingly, his age and career volatility had moved him past "pure prospect" status, so there wasn't much about him out there in the prospect sphere, which is fine because I already tend to limit what information I consider because I want to form my own opinions. In this case, I really had a bare minimum of information going in, not even information about his repertoire. So, I started by watching a handful of Lamb's minor league starts this season. Interestingly enough, my initial impressions were actually later reinforced by his MLB performance. 1. 4-Seam Fastball -- His fastball velocity isn't plus, but he sits comfortable 91/92/93 and commands it well. He does an especially good job of throwing it on the inner half/corner of the plate to right-handed hitters. 2. Cutter/2-seamer -- He also throws an 89 mph cutter/2-seamer that moves down-and-in to righties. 3. Slider -- He also throws a 73/74/75 mph slider that is relatively forgettable, to the extent that it might be a slower version of his cutter or a harder version of his curveball. 4. Slow Curveball -- He throws a big, slooooowwww curveball that I kinda love. It sits in the 68/69 range and it feels like it will either be a very good weapon or a total novelty pitch. 5. Change-up -- His change-up is inconsistent, but when he throws it well it's a dead fish change-up. It sits 72/73 and it can sink and fade. I'm optimistic about this pitch. The fastball was less than I expected. One of the few things I had heard about him at the time of the trade was that his fastball was in the mid-90s, but it's clearly a step below that. He operates in several different velocity tiers, including a rare pitch that could be an MLB weapon against MLB in the upper 60s. His fastball command seems strong and he's particularly comfortable working inside to righties. His breaking pitches were somewhat muddled. There wasn't a clear distinction between his Cutter/2-seamer and his slider, as the velocity was inconsistent and it was difficult to tell where one ended and the other began. It's tough to tell whether the curveball was a gimmick/show-me pitch or a legitimate weapon. His breaking pitches almost seemed muddled to such an extent that it was confusing to Lamb himself. Overall, it's a nice combination of pitches, but also one that suffers from insufficient differentiation. He needs to tighten up, and clearly define, the breaking pitches. When watching him, especially his fastball command to inside corner against righties and his ability to break his cutter down-and-in to righties, I wondered if he would suffer from a reverse platoon-split. Watching him struggle to differentiate between his slider and cutter and his difficulties in sequencing the curveball only reinforced my concern about his work to lefthanded hitters. As for mechanics, Lamb is actually pretty sound. I don't see any real red flags that would make him a heightened injury risk, and yet he's already undergone TJ surgery. Personally, I have a general rule that I would not target TJ-survivor pitchers. Not on the free agent market. Not in the draft. Not in trade. I'm of a mind that serious arm injury is the "downstream effect of an upstream cause." Tommy John surgery cures the effect, but what was the underlying cause? If that hasn't been addressed, then it seems likely another arm injury is lurking over the horizon. Ideally, the cause was something like overwork as a young pitcher, which is a one-off, non-recurring problem. However, if the upstream cause is something like a mechanical issue, then that needs to be addressed to avoid another downstream-effect. All that said, there are exceptions to every rule and the wisdom of acquiring those survivors depends primarily on acquisition cost. It's cost that drives risk. Given that Lamb (1) makes the minimum salary and (2) represents just one piece of a three-player return, there's minimal risk to his acquisition. So, I'm on-board here, as getting multiple assets in return diversifies that risk, I just wouldn't make a habit of it. Still, Lamb is a tall, big league ready southpaw with clean mechanics, solid stuff, and good command. That's a combination that should play at the big league level. He seems like a reasonable bet to be at least a back of the rotation pitcher and his strikeout rate makes him a decent gamble to be something more than that. Still, I'd like to see him clean up his breaking pitches, probably by dumping the slider (it's very difficult to throw both a slider and a cutter, as they tend to blend together and water down each) and refining the curveball, so he has a better understanding of how to sequence his pitches and attack hitters. Refining his repertoire will only help him develop and implement a plan of attack. Now it feels like there's some uncertainty surrounding those breaking pitches and that might explain his heightened hit rate. Finnegan is the middle child of the southpaw trio. That holds true in terms of age and in terms of projection. Lamb is the oldest by roughly three years, while Finnegan is 1 full day older than Reed. In terms of projection, Finnegan doesn't have John Lamb's floor or Cody Reed's ceiling. Lamb needs some refinement, but he's ready to hold down a spot in the big league rotation. Reed is arguably the farthest away, but he has the biggest upside. Finnegan was drafted with the 17th overall pick in the 2014 draft by the Royals. He became the first pitcher to pitch in the College World Series and the MLB World Series in the same season. Not a bad year. The problem with Finnegan is that the Royals have been bouncing him back and forth between the rotation and the bullpen, the majors and the minors. That may have suited the Royals short-term needs, but it did no favors for Finnegan's development. At this point, it's difficult to know whether Finnegan is stretched out enough to hold down a rotation job right out of spring training. Unlike Lamb, who is tall, low effort, and smooth, Finnegan is short, herky-jerky, and (relatively) high effort. Finnegan also has a big arm swing, so he's a bit long in the back of his delivery. Finnegan's repertoire is clearly defined. He works with a 3-pitch mix, a fastball (PitchFX labels it a sinker), change-up, and slider. The fastball/sinker sits 92/93 with real arm side run. The changeup clocks in at 84/85 and also has some arm-side run and sink to it. His slider sits 82/83 with good bite to it. Overall, he throws three pitches, all of them in a 10-mph range. Does he hit work in enough velocity tiers? Maybe. Does he have enough variety to keep hitters off-balance? Maybe. Unlike Lamb, who needs to pare down and refine his offerings, Finnegan may need to broaden and diversify his offerings. Finnegan's repertoire will play at the big league level, but I don't see a ton of electricity in what he throws. The changeup looks like his best pitch with fade and sink. The fastball has some real arm-side run to it, but isn't overly explosive. The slider has good potential, but I wish it had a bit more power behind it. If he's going to be more than a middle-to-backend of the rotation starter, he'll have to improve on his offerings. Adding more velocity to the fastball, more power to the slider, or learning how to cut the fastball so that he can shape it in either direction would raise his ceiling. Of course, that's easier said than done. Cody Reed has the widest range of possible career outcomes. That makes him the biggest risk, but also potentially the biggest reward. If this deal is going to be a massive win for the Reds, then it's probably because Reed pays off in a big way. My first impression of Cody Reed was just how tall he looks on the mound. He's 6-5 with broad shoulders and looks every inch of it on the rubber. My second impression of Reed was that he has a very quick arm and ball really explodes out of his hand. If he doesn't make as a starter, then it's easy to imagine him as a Zach Britton, a lefty who somewhat slings the ball and gets it on the hitter before they expect it. But, right now he's looking every bit the part of a starting pitcher. Reed works with a 3-pitch mix: a fastball that sits 92-94 and touches 96 with some sink, a slider, and a change-up. He has shown flashes with the slider and change, but right now he can dominate with the fastball. When he's on the mound and rolling, it really feels like he's pitching downhill. That electricity that I didn't see in Finnegan? Reed has it in spades. He's pure electricity and his upside is exciting. He throws from a low three-quarter arm slot that will scare some pundits, as they don't think a lower arm slot can work against opposite side hitters. Reed isn't having much problems with hitters of either handedness right now. Reed needs to continue working on the change and slider, so he's got some development left to do, but the upside is there. Reed is the answer to those critics who felt the return on this trade was more quantity than quality, more floor than ceiling. If things break right, he could be a very good starting pitcher for the Reds. If not, then maybe he's the second coming of Zach Britton. Right now, I'm betting on the rotation for Reed. He could be special. I know many in Reds nation aren't enamored with Walt Jocketty. I have a hard time figuring out why, as his track record in trades is one area where he's really strong and I'd argue that the return on the Cueto trade is just the latest example. The return on this trade offers a strong blend of high probability, high ceiling, and close proximity assets. It's a serious haul of talent for 2+ months of a pitcher they could no longer use or afford. Acquiring three players diversifies the risk and gives the Reds multiple avenues to both winning the trade and generating value from it. To me, this trade is a clear winner for the Reds, restocking a farm system that was short on impact and depth. I also doubt the Royals have any complaints about the trade, so maybe it's the rare trade that pans out for both sides. We shall see. For now, it's high marks for Walt and a brighter future for the organization. The Rebuild and Abandoning the Middle Path? The Reds have (reportedly) committed to a tear down and a rebuild. Everyone is now (reportedly) available. The page has (reportedly) been turned at long last. This qualifies as good news. Even the most starry-eyed optimist has to admit that this team isn't configured to win, especially in light of the divisional competition. The Cubs are only going to get stronger. The Cards are the Cards. The Pirates aren't aging out yet. Quite clearly, changes must be made. MUST. BE. MADE. The Reds have aimlessly wandered the middle path between contention and rebuilding for too long. In the face of the inevitable end-of-days, they elected to dance the night away rather than face the looming specter of reality. They held on to their fading reality until the wee hours of the morning. There's something oddly endearing about that, but the party is now over. Night is giving way to day and the rising sun is revealing the truth to all. Not even those who have chosen to be starry-eyed optimists can now deny in the harsh light of day the carnage strewn about the landscape. Hopes dashed here, best intentions fractured over there, and organizational dreams of success strewn about and trampled under foot like confetti from good times long since over. It's time for sober, unflinching reality. The bill has come due and the good times have ground to a halt. It's time to get to work and clean this mess up. It's time to get rid of the stragglers still passed out on the coffee table and in the hedges. It's time to sweep away unrealized dreams and start anew. The Reds had a good run. Fans may not appreciate it now, but they should. It's disappointing that this team never reached, much less won, the World Series. In hindsight, it all peaked and crashed on one swing of the bat by Buster Posey. We didn't know it at the time, but when Ryan Hanigan dejectedly hung his head as the ball arched up and into the left field seats at Great American Ballpark, he was hanging his head for all of us. That was our last, best chance for a World Series. We let it slip away. At the trade deadline, the Reds started the process. They at least recognized that 2015 was a lost cause and started trading impending free agents. So, we'll look back before we look forward and we'll do it quickly because the Reds are ready to move. That said, the first thing the Reds need to do is figure out who they want to be. They need to develop a plan for roster construction before they break ground on construction itself. 1. Pick a rebuilding timeline and COMMIT TO IT! Pure intent and full-on commitment can be the difference between success and failure. While the Hot Stove is sizzling with news that the Reds are making everyone available, it remains to be seen what type of rebuild they envision. There are two different paths to take, quick or total. A quick rebuild would basically mean trying to build around Todd Frazier and Jay Bruce while they are still in their peak years. A total rebuild would mean moving on from Todd Frazier and Jay Bruce. Oddly, everyone else is either too old (Phillips) or too young (Hamilton, Mesoraco) to be much impacted by either type of rebuild. For me, it comes down to whether the Reds are going to deal Todd Frazier. If they hold on to the Todd Father, then the rebuild needed to focus on upper level minor league prospects or young MLB talent. If they deal Frazier, then they can also target younger prospects. Money is to baseball operations what velocity is to pitching: the more of it you have, the greater your margin for error. In those terms, the Reds aren't quite Jamie Moyer, but they clock in somewhere around Bronson Arroyo. Basically, the lower your payroll, the fewer misses you can afford to make. Not only do the Reds not have much margin for error, but they also can't afford to roster surplus assets. To get back to being a contending organization they need to sync-up the productive years of their assets. It doesn't do them any good to bring assets who are 3-4 years away, because Joey Votto and Frazier will be in real decline by the time those types of assets are established and productive. Failure to sync up asset productivity just ensures that they will be consistently average for the foreseeable future. They may avoid valleys, but they also limit their chances of actually reaching the summit. One of the interesting things about last offseason's trades was that Walt seemed to really target disciplined hitters. Guys who could control the strike zone. To recap, Walt landed Chris Wallach in the Mat Latos trade. He then landed Eugenio Suarez in the Alfredo Simon deal. Suarez hasn't shown it as much at the big league level, but in the minors he showed flashes of being able to control the zone and produce high walk rates. I wonder if Walt recognized a deficiency in the system and took steps to address it. This past draft, Chris Buckley, Senior Director of Amateur Scouting, made the statement that, when it comes to position players, he targets athleticism and up-the-middle players. Personally, I'd rather have a heavy thumb on the scale in favor of disciplined hitters. I wonder if Walt agrees with me. I am hoping that Walt prioritizes acquiring disciplined hitters. If he does, then it might be evidence of his recognition that Chris Buckley doesn't focus on players with that type of offensive profile. As it stands, it's fair to wonder whether such a trade approach is necessary to compliment Buckley's draft philosophy. Regardless, this team needs tougher outs in its lineup, which means fewer guys willing to give away outs and flail away at pitches. Does the organization need to fill in through trade the gaps inevitably created by Buckley's draft approach? The Reds now seem willing to tear it down and start over. It remains to be seen to what extent they will, but it seems like ownership and front office are finally on the same page and recognizing that the end-of-days has arrived. This is an important and interesting offseason for the organization. If they do it right, then bottom of this cycle might be fairly shallow. If they flounder about, then they could be looking at a long, sustained period of irrelevance. While I want an emphasis on disciplined hitters, the most important thing is intent. The organization needs full blown commitment to a plan. No more half measures or middle path, just complete and total buy-in to a clearly established plan for rebuilding. The competition is too intelligent, focused, and committed for us to find success without matching their efforts. It's a huge offseason for the organization. The clean-up starts now. 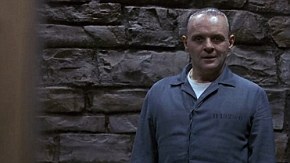 I've seen The Silence of the Lambs a number of times, but I never understood the power of this borderline throw-away-line from Hannibal Lecter. Evidently it gets lost in Hannibal's neatly tailored prison jumper and psychotic unblinking gaze, but it's an idea worth chewing on...so to speak. To me, first principles is about getting vertical with your thinking. The good doctor cites to Marcus Aurelius, but the credit more properly belongs to Aristotle. Adopting first principles leads to a simple shift in thinking, but one that unlocks an entirely new perspective. If you reason from first principles, then you are simplifying things down to their fundamental truths and then reasoning up from there. The more common style of reasoning is by analogy, which is a more lateral style of thinking based on existing similarities and things we know. The importance of first principles is that it allows you to truly see underlying commonalities between seemingly disparate ideas and concepts. Things that on their face seem completely different, when boiled down to their basic elements, can suddenly seem connected by a common thread. That's a powerful thing. Maybe it's what Albert Einstein was talking about when he said, "Everything should be made as simple as possible, but not simpler." I'm not smart enough to truly know, but it seems like the Elizabeth Holmeses and Elon Musks (a First Principles proponent, by the by) of the world are ahead of the curve because they have both (1) the ability to see the commonalities between disparate ideas and concepts, and (2) the ability to see both the big picture and small picture at the same time and switch freely back-and-forth between the two. In other words, they can see "the forest" and "the trees" at the same time. To put some meat on the bones of this analogy, let's make it a bit more literal. To start, let's take "seeing the trees," so imagine that you're traveling through dense jungle. You can't see more than a few feet in front of your face and to make any progress in your travels you have to hack your way through with a machete, breaking trail with every step. You might be the best trail breaker in the world. People might come from far and wide to study your technique to learn how you swing the machete so powerfully, swiftly, and tirelessly. However, if you can't get vertical in your perspective, then your progress will always be limited by your vision. On the other hand, let's take "seeing the forest," so imagine you are able to get above that dense canopy jungle and see the big picture. If you can get vertical, then your perspective will change and you'll have the ability to see where to go and how to avoid obstacles to make real progress in your travels. You'll be able to effectively navigate the terrain, but you also have to know how to break trail in order to make progress. The best travelers will be able to simultaneously see the forest and the trees, to excel at the machete swinging AND the land navigation. Those are the geniuses, the people whose brains clock at speeds the rest of us can't fathom. The people who can hold these two differing perspectives in their brain at the same time. So, how does all of this relate to baseball? Well, in the final analysis, baseball teams are merely the sum total of their organizational decisions. Draft picks. Free agent signings. Trades. Player development hires. Decisions. Decisions. Decisions. When two teams take the field, you are watching one organization's decisions square off against the other organization's decisions. Ultimately, the better decisions will carry the day. When I read Moneyball, one of the many things I took from the book was that player names are just proxies for the probability of obtaining a certain level of production. Fans love the personalities, style, and individuality of the player, but front offices are merely trying to tap into that player's production. So, when Billy Beane went to replace a "Jason Giambi," he didn't try to replace the player, he tried to replace the aggregate production. So, he broke Giambi down into his component parts and tried to rebuild that production over multiple roster spots. That philosophy changed the way I look at players and production. Similarly, I now look at teams as largely the sum total of their organizational decisions. If you look at it that way, then the primary goal of any organization should be to improve its decision-making process; to increase the probability of making a "correct" choice on every possible decision. When you root for a player, you are rooting for the probability of a certain level of production, when you root for a team you are rooting for a bundle of organizational decisions. How do you increase your chances of making a "correct" decision? By understanding the true nature of the thing. If you understand something's true nature, then you understand how to properly value it. How do you understand something's true nature? By drilling down and down and down until you reach its fundamental truth. You can engage with an idea on a number of different levels. If you engage with it on its fundamental level, then you are more likely to be able to consistently identify it in the future. A baseball example of engaging an idea on different levels can be found in hitting ability. At what level do you want to engage the idea of hitting ability? Let's take a quick look at this handy pyramid of levels, representing a simplified evolution of hitting evaluation, before we get into the discussion of these levels. Henry Chadwick is credited with creating the box score and a variety of statistical measures. Chadwick felt that batting average was the best representation of a player's offensive skill and, for a lot of years, that view was reflected in the way teams were constructed and players were valued. However, as we all now know, batting average is not the best representation of a hitter's ability, as it contains a great deal of fog that clouds a player's true performance level, including park effects, quality of opposing defenses, and random chance. The next breakthrough in evaluating hitting ability came about when Voros McCracken discovered Defense Independent Pitching (DIPs) and the notion that a pitcher/hitter does not have true control over whether a ball in play results in a hit or an out. That discovery led to the use of Batting Average on Balls in Play (BABIP) to put batting average into context in an effort to strip out the "luck" component. After that, the next step in the evolution of hitting evaluation came with the use of batted ball type, as certain types of batted balls were determined to be much more likely to result in a hit than others. So, batted ball type was added to BABIP in an effort to put batting average into even better context and eliminate a larger percentage of the fog surrounding true ability. Currently, we have reached what may well be the fundamental components of hitting ability. Technology has enabled us to measure batted ball characteristics in ways that were previously unimaginable. At this point, we are beginning to measure hitting ability through (1) exit velocity, (2) contact rate, and (3) launch angle. Given that hitting is largely a function of (1) how hard you hit the ball, (2) how often you hit the ball, and (3) the type of loft you get on the ball, we may have finally uncovered the fundamental truth of hitting ability and reached the top of the pyramid in the process. It seems apparent that the closer you get to the fundamental truth of hitting, the closer you get to understanding what drives hitting success. If you can identify what drives hitting success, then you can more effectively identify those players who have it and how to value it. The recent success of the Cubs under Theo Epstein and the Astros under Jeff Luhnow is revealing the only real "curse" in the game of baseball to be front office ineptitude. The fog generated by a lack of understanding of the fundamental truths of baseball has allowed narratives like "curses" to be introduced into the game. Those narratives are great for the fans, but they cloud the fundamental truths that should govern baseball operations. By harnessing the power of big data, both qualitative and quantitative, and converting it into an actionable form, organizations like the Cubs and Astros are riding stone cold rationality to a better understanding of "true" ability and player value. Of course, there's also real irony to the fact that teams are employing complicated and convoluted statistical measures and data mining techniques in order to reduce baseball to its simplest, most fundamental truths. If you want to know why front offices around the league are engaged in a race for brainpower, it's because the more intellectual horsepower in your front office, the more likely you are to uncover the fundamental truth of the components of baseball. And, if you uncover the fundamental truth before the opposition, then you have a real and exploitable competitive advantage. In the end, the better your understanding of something's true nature, the more likely you are to value it correctly. Better understanding comes from getting vertical in your thinking. Get vertical, Reds, get vertical! ...or, at least, nice, disciplined, professional hitters. The 2015 draft has come and gone. The Reds didn't draft the players I wanted. Brendon Sanger? Surely you jest. That's all well and good. They undoubtedly know more about those guys than I do. Still, I can't help but be disappointed that they didn't draft them. On some level, I'm most disappointed about Brendon Sanger. I like Sanger's game. I really do. But, the larger disappointment isn't missing out on one specific player (one who might, admittedly, be more of a fourth outfielder type), it's the failure to adopt a draft strategy that prioritizes the acquisition of these types of players. The Reds are on the precipice, the fall is coming. A rebuild isn't just advisable, it's inevitable. As part of that rebuild, I really wanted to see the Reds prioritize the acquisition of players with strong hit-tools and plate discipline. Looking back on the Houston Astros fiasco with Brady Aiken from a year ago, I remember Jeff Luhnow being very calm about the wasted first overall pick. He stated that, while it was unfortunate, the club would be fine and that it wouldn't even be detrimental to the rebuild. The sentiment was surprising in its authenticity. At the time, the Aiken situation was turning into the storm of the century. Everyone had an opinion. Everyone was caught up in it. Somehow, in the face of it all, the Astros were the calm center of the storm. The Astros could remain calm for the simple reason that their focus is on process, not individual players. Fans get obsessed with the player, the organization is obsessed with the process by which every player is acquired. Fans get invested in the name on the back of the jersey, whereas for the organization that's merely a proxy for the probability of receiving a certain level of production. If that player is gone, then they just find a new way to approximate that lost probability. To some extent, it's a formula for production. They are always trying to improve their process, because the process will constantly yield the players. The Reds have their own process. It's not as systematic, nor as ruthlessly calculating, as the Astros' process. Even so, the Reds' process emphasizes players who fit a certain profile. "We just find the more athletic they are, the better adjustments they make and the better they can handle everything," Reds senior director of scouting Chris Buckley said after the Draft ended Wednesday night. As is often the case, the Reds loaded up on pitching and took 21 pitchers over the three days. But they also loaded up players that play up and down the middle of the field. Fifteen picks were either catchers, middle infielders or center fielders. "We always try to do that," Buckley said. "Todd, Devin and Drew Stubbs were up the middle guys. All are very athletic. A lot of these guys do different things well, and we project them for something else." So, there you have it, in a nutshell. The Reds look for (1) athleticism and (2) players who play up-the-middle defensive positions. A quick look at the team's picks in the top 20 rounds bears this out: 13 pitchers, 1 catcher, 3 shortstops, 2 second basemen, and 2 centerfielders. Not a corner player in the bunch. There is clearly a lot of value in athleticism at premier defensive positions. So, targeting such players make sense...to a degree. At the same time, by focusing almost exclusively on that profile, you are overlooking a certain subset of players. A potentially valuable subset. This excluded subset includes corner players and players who are longer on baseball skills than athleticism and tools. The obvious problem is that most impact hitters come from the corner spots and most disciplined hitters are longer on skills than tools. There are only so many Troy Tulowitzkis and Robby Canos in the world and even if they are in the draft pool then they won't be there for long. In the current top 20 round draft class, Blake Trahan might be the one player who overlaps both the Reds criteria (athleticism, premier position) and the disciplined hitter criteria (controls the zone, more walks than whiffs, etc) that I think they need. There just aren't many who fit that particular profile. So, are the Reds, an organization frequently short on disciplined hitters, undercutting their ability to develop them by adopting a draft strategy that largely eliminates them from consideration? It seems like it. If they didn't like Brendon Sanger (4th round, 135th overall to the Angels), then maybe they could have reeled in David Thompson (4th round, 119th overall to the Mets), David Kerian (9th round, 284th overall to the Nationals), Austin Byler (11th round, 316th overall to the Diamondbacks), or any number of players who fit a more disciplined profile. None of these types of players may pan out, but the underlying point is that you can't end up with a Matt Carpenter type if you don't draft disciplined hitters. You can't really teach the ability to control the strike zone, you either have it or you don't. At the opposite end of the "organizational philosophy" spectrum from the Reds would probably be the Cardinals, who are never short on disciplined hitters. The Cardinals are willing to draft and develop players who are short on athleticism and long on baseball skills. Players like Matt Carpenter, Allen Craig, and Stephen Piscotty leap to mind. In the modern game, there is very little more valuable than a plus hit-tool and/or plus on-base ability. That means that the acquisition cost of those types of players is massive. Simply put, if the Reds aren't drafting those players, then they won't be able to acquire them without incurring massive expense. Draft and develop them, it's the only way. That means that the ability to control the strike zone should be a much larger thumb on the scale in the draft process. Unfortunately, it isn't. Join the Discussion on the new Redlegs Baseball Message Board!!! Pitching Mechanics and "The Kinetic Chain"
Blessed (or is it cursed) to be a Reds fan. I've loved baseball as long as I can remember. Played it until they told me I couldn't anymore. Now, always thinking on it. ................................................................ Follow me on Twitter: Lark_11 .................................................................... Redlegs Baseball message board: Lark11 .................................................................. Redszone: 11BarryLarkin11 ........................................................................ If you need to reach me with comments, complaints, or otherwise, you can always shoot me an e-mail at 11BarryLarkin11@gmail.com.